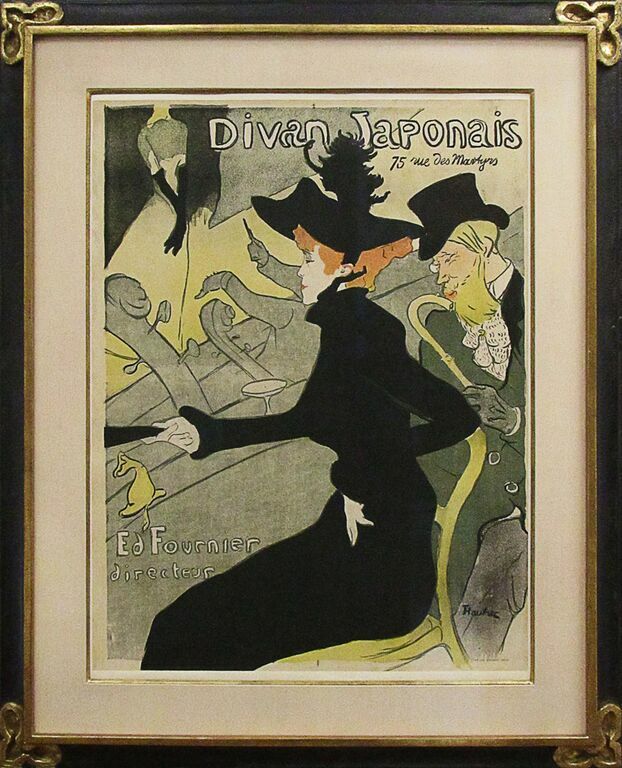 In this poster for the Divan Japonais café concert, Jane Avril “appears to be almost smiling, as if the whole thing were an inside joke. Jane is accompanied — or, more likely, being accosted — by noted critic Edouard Dujardin, no doubt with amorous intentions, but her faintly bemused expression indicates that she is used to this, and will be able to handle him without any trouble. Note that the performer — although it is a great celebrity, the famous Yvette Guilbert — is not the focus of the poster, and Toulouse-Lautrec makes sure of it not only by placing her somewhat indistinctly in the poorly-lit background, but even by going to the length of deliberately cutting her head off…Toulouse-Lautrec has made good use of spatter, a technique which adds another dimension to poster art: here, for example, it effectively separates the solid black of Jane’s dress from the less important dark mass of the bar and the orchestra” (Wine Spectator, 42).